We're staying open late for an evening concert on the patio! 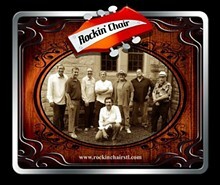 Rockin' Chair Tribute to The Eagles will perform live from 5:30-8:30pm. Bring your friends and enjoy dinner, food, and rocking tunes. $10.00 advance cover/$15 cover at the door. Tasting Room will be open all day 11am - 9:00pm. Café will be open 11am-8:00pm. Cover charge only applies to guests entering the patio area for the entertainment. Call 636-482-9463 to order tickets in advance.